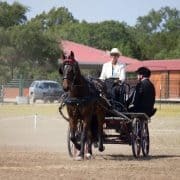 The importance of warming up your horse, especially when you are at a driving show or a Combined Driving Event is probably the most important part of showing and competing. But it does have to be done correctly. Learning how to warm up your horse starts at home as part of your normal routine. 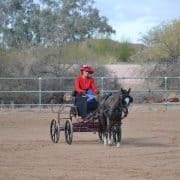 All horses, whether you compete with them or just drive them for fun on the trail where you live, need to have a warm up period in which to get, not only their bodies ready for work but also their minds. We will address the mind first, for without it being present you won’t even need the body. A well-trained horse who has a particular job, in this case, driving, needs to have his mind on the job at hand. 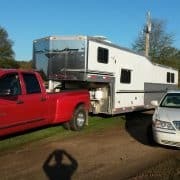 Most of the time when you go to drive your well-trained horse he is there with you, but there are those few times when you are all hitched up and ready to drive out and within the first five minutes you get the feeling that your horse woke up on the wrong side of the bed! Large warm-up area away from other horses. Eileen is driving Pinegrove’s Sailor Boy. 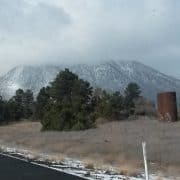 When this happens the best thing to do is ask him to do just one small thing, say like halting and backing up two steps. Then you take him back to where you hitched him up, unhitch him, take off the harness and put him in his stall. You will be thankful later, because he will remember that kind gesture when you least expect it. Even horses can have a bad day, for whatever reason, and it is just not worth the fight! I have had this happen with my horses, and when I have come back the next day, all is well and good. Just like you and me we sometimes have a bad day for whatever reason. Once he is harnessed and hitched I start by walking him quietly, on a loose rein for about five minutes. I then will move him up to a slow trot to give him time to get all the normal coughing and light snorting to clear his airway and lungs out. Continue to trot him working up to a working trot for about twelve minutes and going approximately 1.8 km. I do this whole warm up on my property by going around the flat part of my course four times. Then I walk him for about five minutes, or until his pulse and respiration comes down to normal. This is my warm-up that I do every time I go to drive Sailor. 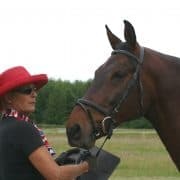 You need to note that Sailor is 16.1 hands and about 1250 pounds, so it takes this amount of time to get all his muscles and tendons warmed up to be able to work on dressage, cones or the endurance that is needed for a marathon course. 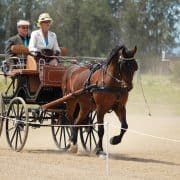 This type of warm-up will keep your horse sound, so if you don’t have a lot of time one day to drive more than about 15-20 minutes, then just use your warm-up as your drive time. Warm-up time is still driving your horse and having fun. So, you are at a driving show or are getting ready to do one of the three parts of a Combined Driving Event and you need to warm-up. You want to do the same warm-up that you do at home. First, doing what your horse is used to in a warm-up will keep him thinking there is nothing different about what he will be doing. If you don’t lounge him at home don’t do it at a show. If you don’t canter him around for ten minutes at home don’t do it at the show. I think you get the idea. You want to make the warm-up seem as normal as possible. The last thing you want to do is get your horse hyped up or so exhausted he will not be able to show at his best. When I am warming-up at a competition I try to find a quiet area in which to do this. 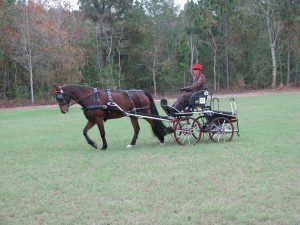 When at home my horses are generally driven by themselves so trying to warm-up in a place where there are ten other carriages being driven around can become distracting to your horse. At a show or competition is not the time to try and teach your horse anything new. If he does not know it by the time you leave your ranch, he will not miraculously learn it during warm-up. If you think after the warm-up that your horse is not really wanting to do this competition, there is no shame in pulling out of a class or portion of a CDE. Take his normal water and feed buckets with. Just remember going to a show or competition is supposed to be a fun experience for both you and your horse!